Fins Hospitality Group is officially hosting events and offering catering services! Our award winning restaurants are opening their doors and kitchens to make your event be everything you hoped for and more. Our packages are crafted with you in mind with options for lunch and dinner. Opened in 2005, Fins Fish House & Raw Bar was the first of our restaurants. Located on Rehoboth Avenue, Fins Fish House features two bars, a raw bar, and an upstairs and downstairs dining space. 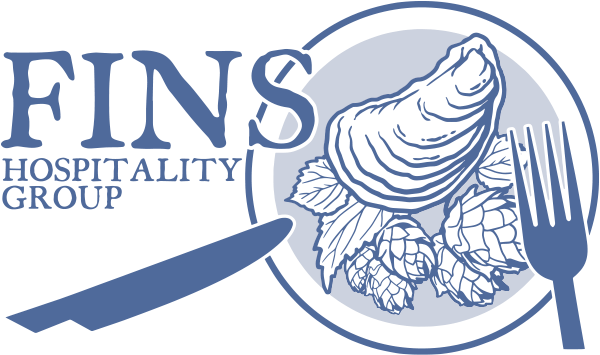 Conveniently located on Coastal Highway, Fins Ale House & Raw Bar was founded in 2013. Fins Ale House features four dining spaces, including outdoor seating, private room with a bar, and views into our original pilot brewery for Big Oyster Brewery. Fins Ale House & Raw Bar located in Bethany Beach opened its doors in Memorial Day weekend in 2017. Fins Ale House features a bar, outdoor seating, and two dining spaces. Right on Main Street in Berlin, Maryland, Fins Ale House is our first restaurant in Maryland. Opened in 2016, Fins Ale House features upstairs and downstairs dining, two bars, and upstairs and downstairs outdoor seating. Big Oyster Brewery opened the doors to its full service restaurant and brewery in 2017. Located conveniently on Kings Highway in Lewes, Delaware, Big Oyster offers a variety of craft beer, outdoor seating, and views into the brewery and aging room. Located on Rehoboth Avenue, Claws Seafood house has been open since 2006. Claws featuring a bar, indoor and covered porch seating and dining.